Director/Screenplay – Bernard Rose, Based on the Short Story The Forbidden by Clive Barker, Producers – Steve Golin, Adrian Poul & Sigurd Sightvarsson, Photography – Anthony B. Richmond, Music – Philip Glass, Visual Effects – Cruse & Co, Special Effects – Special Effects Unlimited (Supervisor – Martin Bresson), Makeup Effects – Image Animation (Supervisor – Bob Keen), Production Design – Jane Ann Stewart. Production Company – Propaganda Films. 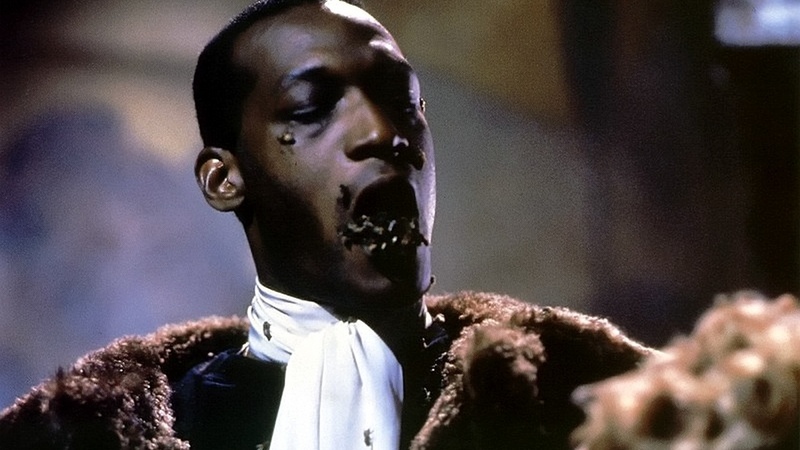 While writing a paper on urban myth, anthropology student Helen Lyle becomes fascinated with the myth of the Candyman, a bogeyman with a hooked hand who can reputedly be invoked if one says his name five times while looking into a mirror. She finds that residents in the Chicago ghetto of Cabrini Green have attributed several recent murders to the Candyman. As Helen investigates, the Candyman manifests to her, wanting her to join him. 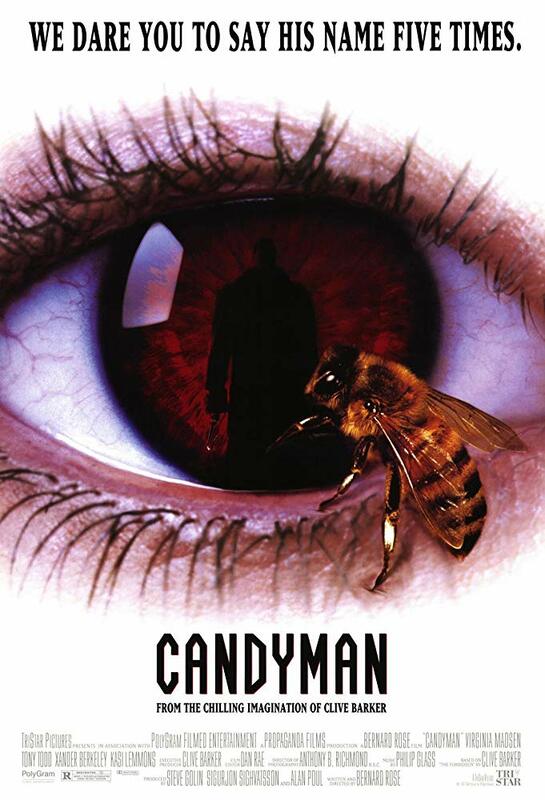 Candyman then conducts a series of killings so that Helen will believe in him. This Clive Barker adaptation ‘– based on Barker’s short story The Forbidden (1985) – turned out to be the horror sleeper of the 1992 season. Candyman is a cerebral and well-made horror film and was quickly, perhaps over-hastily, acclaimed the new horror masterpiece of the 1990s. Director Bernard Rose, who previously made the worthwhile Paperhouse (1989), produces a number of startling shocks. Each sequence with the people invoking the Candyman becomes a breathlessly drawn-out wait. There are striking and eerie touches – like the murder of the psychologist, drawn up from beneath by Candyman’s hook and Candyman’s subsequent disappearance in a foetal ball up through a window; the bizarrely fetishistic touch where Viginia Madsen surrenders to Candyman and he opens his coat, revealing a bee-filled torso, the bees covering her as he comes to kiss her. Although these are sometimes undercut by an irritating preponderance on Bernard Rose’s part toward silly red herring shock jumps – like when Virginia Madsen calls Candyman five times for the first time and this has had no effect before Xander Berkeley jumps from off screen and into bed with her. A somewhat overweight Virginia Madsen gives a satisfactory performance and Tony Todd, with a beautifully mellifluous and resonant basso voice, has a magisterial presence. A horror film that works on the level of story rather than viscera, contains well-sustained shocks and has a good cast – there is usually little else that one would ask of a horror film. 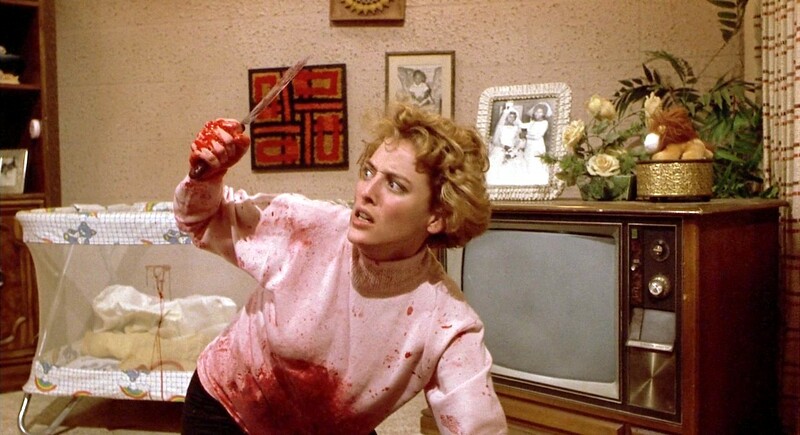 For all that, Candyman is a film that disappoints and, one feels, falls short of its new masterpiece label it was given in the horror press. It only connects on a level of well-contrived shocks. Despite all the elements for it, the story never engages beyond a schematic level. Candyman’s psychological games are left to fill the gap and come plotted in an overlong and relatively unsurprising way. The heart of the story is taken up by a predictable run of character-tries-to-prove-sanity games where in fact it should have engaged with its perverse romance. The romantic angle never connects on an emotional level and as such seems underdeveloped – we never learn, for example, why Candyman wants Virginia Madsen in particular. The only character progression Madsen gets to make is to passively surrender to the inevitable. Candyman was followed by two formulaic sequels Candyman: Farewell to the Flesh (1995) and Candyman: Day of the Dead (1999). Both featured Tony Todd repeating his role as Candyman. Director Bernard Rose went onto make the likes of Immortal Beloved (1994) and Anna Karenina (1997) and returned to the horror genre with Snuff Movie (2005) and the modernised Frankenstein (2015). Clive Barker has directed three films – Hellraiser (1987), Nightbreed (1990), and Lord of Illusions (1995). Barker has also written the screenplays for – Underworld/Transmutations (1986) and Rawhead Rex (1987), written and acted as Executive Producer on Gods and Monsters (1998), wrote and produced Saint Sinner (2002), produced The Plague (2006), and provided the short story basis for one of the stories in the tv movie Quicksilver Highway (1997) and the stories for the films The Midnight Meat Train (2008), Book of Blood (2009) and Dread (2009).